Has Social Media Made Me A Better Doctor? 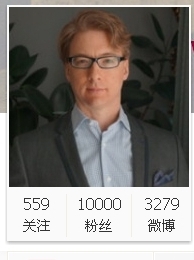 This month I hit a milestone on my Sina Weibo microblog; I finally reached 10,000 fans. It took more than two years, and I suppose I could have sped it up by paying for fake zombie fans. However, I preferred to earn this honor with good old fashioned hard work. Ten thousand fans is a tiny amount compared to many Chinese microblogs, including several at my own hospital like our pediatrician Cui Yutao, who has an astonishing 1.3 million fans. But since I write mostly in English and not native Chinese, it’s a very respectable amount for a laowai’s Weibo. Presently I manage two popular, mature social media sites: my Weibo for Chinese readers, and my older health blog for expats. But as I pop open the baijiu to celebrate, I can’t help but wonder what impact have these sites truly had? And what lessons, if any, can help other doctors interested in social media? I believe the first question is the easiest to answer, with a resounding yes: a doctor’s social media writings can have a major positive influence on a community — much larger than their clinic population of a couple thousand patients within a few square miles radius. My blog’s articles have been read almost a million times by readers in 198 countries and territories, and some of my articles helped improve public health awareness on hot issues such as air pollution and food safety in China. It also provided helpful information during times of crisis such as the Fukushima radiation scare — as well as our current crisis with H7N9 avian flu. While my expat blog found instant impact, I was always acutely aware that my audience was relatively small, consisting only of the few hundred thousand English speaking expats in China. What about the other 99% of Beijing, who are just as hungry for information about the same issues? I was especially disturbed that I could instantly flash emergency air pollution AQI from the US Embassy site to my expat readers, but local Beijingers around me usually had no clue about these ‘crazy bad’ emergencies. So how could I reach the rest of China even if I didn’t know much Chinese? It certainly wasn’t Facebook or Twitter, the obvious choice in many other countries but a non-starter here. The answer was obvious: Sina Weibo. All the newspapers and marketing reports had breathlessly covered Sina Weibo’s meteoric rise and impact in China, so I opened an account and started typing away. The language barrier wasn’t insurmountable, because even if only 5-10 percent of Weibo readers can read English, that is still a potential audience of tens of millions. That dwarfs the entire population of expats in China. Weibo’s reach and impact truly is amazing. On my expat blog, a successful article will be read a couple thousand times over its first month. On Weibo, my most popular posts receive tens of thousands of views — often in just the first couple hours. It’s an extraordinarily rapid and powerful tool to share information. Two years and 3,000 posts later, I must admit that I now have a lot more fun writing on my Weibo than my blog. Weibo is much more intimate, interactive and immediate, and also is fast to write — no small benefit for a busy physician. I also feel a deeper satisfaction from my Weibo, mostly because I sense that my Chinese audience is even more starved for credible health information than most expats. In a country where only 10 percent trust their doctor, my Weibo audience is truly grateful to find an online doctor they feel they can trust. Expats know they can turn to trusted, famous health websites like the Mayo Clinic, US CDC, and many others. I occasionally ask my Weibo fans if there are similar trusted health sites in Chinese, and sadly no one can come up with one. My Weibo is also very satisfying because in China there are so many health issues that seem basic to expats but have little awareness in China. Air pollution and food safety discussions on my Weibo are just as popular as from my blog. However, I find more satisfaction discussing less obvious issues, such as using proper car seats for infants, which is scandalously uncommon in China, with only 3% use reported in a recent China Daily poll. I still find it frightening to watch grandparents hold infants in the back seats, truly having no idea their precious grandchild is totally unprotected in any serious crash. Every few weeks I repost a graphic video showing test dummy babies fly into front windows, and another handful of parents will rush out to buy a car seat. I’ve pushed multiple similar issues such as bicycle helmets, another depressingly neglected issue in China. I snap a photo of me in my bike helmet, upload instantly to Weibo, and spark a healthy discussion all over China. In the same vein, I upload a photo of water jugs baking in the summer sun at an uncovered warehouse, and thus spark a debate about bacterial contamination of delivered water jugs — an issue that few still seem aware of, given the massive and increasing popularity of delivered water. Or I post images from the supposedly upscale Sanyuanli food market in the summer, showing piles of unrefrigerated, uncovered meat, and my followers will discuss the virtues of proper food safety. As a family doctor, my judgment of a patient’s health involves not just their symptoms but also their relationships with their family and their community. Therefore, a good family doctor actively strives to improve the health of their community. Because of my social media, I am deeply satisfied that I have helped improve the health and wellness of many more people than just my clinic patients. There are a lot of smart primary care providers out there, energized with ideas and helpful advice they would love to share with a group much larger than their clinical load of patients. My general advice for anyone interested is to go for it, but be careful. First, you will need to review your hospital’s social media policy, if they have one. If you work in an enlightened organization such as mine, hopefully you would be encouraged and supported in your efforts. Richard, my heartfelt congratulations on the birth of your child.